Overlooking the vast length of Loch Tay, the Ben Lawers Nature Reserve is a beautiful area renowned for its rare arctic-alpine flora, particularly in the northern corries. This area also contains many peaks, including Ben Lawers, the tenth highest mountain in the UK. These peaks, of which 7 are Munros, lie in a continous chain stretching for 12km and make for a superb long hill-walking day. 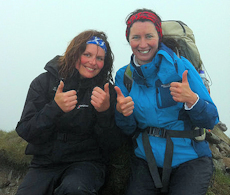 Not as daunting as it first sounds this is an excellent introduction to multi-Munro bagging ! 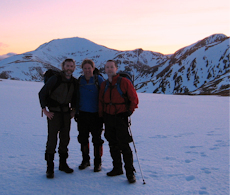 A guided day hiking over high peaks in the Southern Highlands. 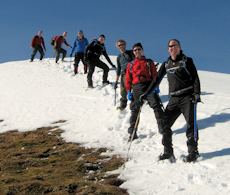 Walk along fine crests and wide mountain plateaux above Loch Tay and Glen Lyon. Reach superb vantage points from where expansive views over the Grampians and Perthshire forests can be savoured. Bag 7 Munros in the area including Ben Lawers, Beinn Ghlas and An Stuc. 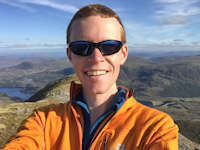 A guided hiking and hill-walking day on Ben Lawers and the surrounding Munros with one of our experienced and qualified leaders. Your guide will know the rugged area well and be able to give you insight into the flora, fauna and geology. 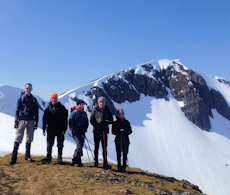 Try your hand at multi-Munro bagging on this day. Not as arduous as it first sounds and with plently of opportunities to discover wildlife and fauna. Depending on the group, pace and weather we will aim to bag 7 Munro peaks in a continuous chain from west to east, therefore minimising our ascent. We'll begin from the northern shore of Lochan na Lairige and head over delightful grassy ground to the foot of Meall a'Choire Leith. Up heather-clad slopes, we'll bag this summit, then turn south and continue over the chain of hills and ascend Meall Corranaich and Beinn Ghlas before climbing Ben Lawers, the 10th highest mountain in the UK. 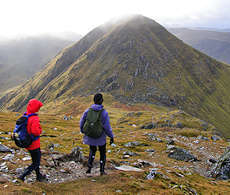 Over An Stuc, we've a rock-scramble to descend before tackling the last two Munro summits Meall Garbh and Meall Greigh. 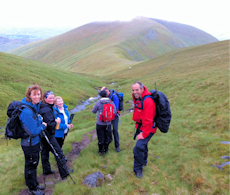 We return to the roadside by the Ben Lawers Hotel, where some food and refreshment await ! We're following good paths lower down leading up grassy slopes higher up to varied terrain higher up. The east ridge of An Stuc is rocky and tricky enough to be classed 'Grade 1' scrambling and therefore requires care. Leading the event on 28 July'19. We'll be starting from the NTS car-park near Lochan na Lairige, which is around 10km north-east of Killin on Loch Tay. We'll aim to finish by the Ben Lawers Hotel, which is around 10km east of our start point. Hopefully we'll organise a car-shuffle at the start of the day to avoid a long walk back along the road.